In Part 1, I described using thinking strategies to design and develop a relevant and useful competency-based training profile. Part 2 focuses on developing a scope document that defines the critical content for each competency and determines where each competency of a sequence (e.g., for a process/system and multiple flows) begins and ends. During the scoping process, the profile of competencies usually gets refined. Part 3 suggests ways to sequence training so that it fits the job and is developmental. A well-developed scope document provides many advantages. During the scoping process, participants work together to agree on the training content for each competency and to ensure the content is relevant and useful and contributes to improved corporate, job, and employee performance. If the training resources cannot be developed immediately but are instead developed over several years, the scope document provides a plan to ensure the right content and right amount of content is developed. Without the scope document, future employees may disagree about what training content is important and they may not be aware of the relationships between competencies. The scoping process is more mentally demanding than the profiling process where the competencies are identified.. Many thinking strategies must be used to identify relevant, useful training content. The thinking strategies I describe below are used when an issue occurs and not necessarily sequentially. While I am working with participants to identify the content scope for a competency, I try to organize the content in a way that may be appropriate for developing the training. During the process, we must always keep the target audience(s) in mind. Keeping the audience’s roles and responsibilities and lines and limits of authority in mind provides focus for the content. Sometimes workshop participants may want to change audience’s roles and responsibilities. For example, an operator in the workshop may suggest that maintenance staff do more (or less). However, changing staff roles and responsibilities is not the mandate of the scoping workshop. This situation causes unnecessary conflicts if the affected stakeholders are not consulted. Defining the limits of authority can sometimes be an issue when developing training for multiple sites. Some supervisors are micro-managers while others prefer to delegate some of the decision making. When scoping the training content, there needs to be some meeting of minds. The criteria used to identify relevant competencies in Part 1 also apply to identifying relevant content for each competency. I tell participants that we will refer to this table frequently so that we can identify the critical content and eliminate the content that will not help the trainees perform their jobs better. Part 1—Develop the first cut at identifying the competencies of the training profile explains the above table in detail. While scoping out a competency, I also think of PEMEO and what could contribute to a loss or optimization of PEMEO (i.e., LO-PEMEO). 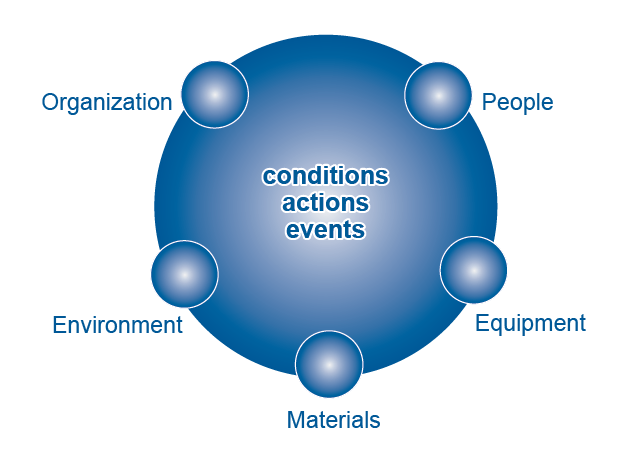 LO-PEMEO stands for Loss and Optimization of People, Equipment, Materials, Environment, and Organization. Conditions, actions, and events define the work environment and the dynamics within the workplace. If I think PEMEO might be relevant, I ask the participants for their input. For more information about LO-PEMEO, refer to the blog Linking corporate, job, and employee performance. Identifying relevant knowledge to perform tasks and make decisions can be challenging. One strategy I use to organize and focus my thinking is the Input-Process-Output thinking strategy This strategy is very useful for organizing training content. 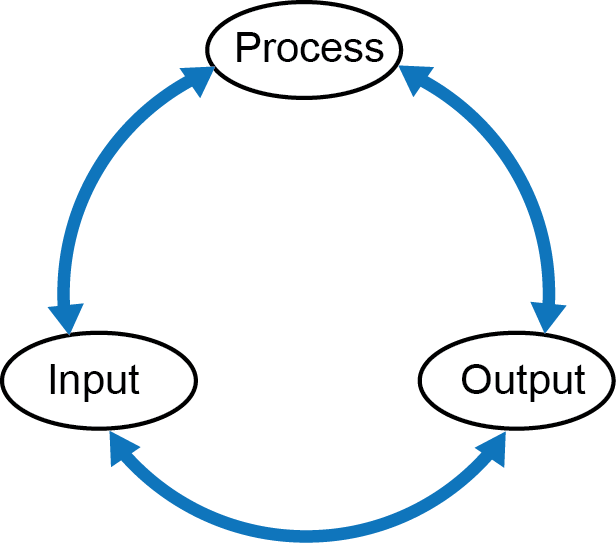 I think of the input-process-output as a continuous loop. I can start at any point in the loop and go in either direction. When organizing training content for a technical process, I could follow the input-process-output sequence. For example, in gas processing, follow the flow for each process or system. When organizing training content for a work process, I could follow the output-input-process sequence. For more information about the input-process-output thinking strategy, refer to the blog A structured way to plan work, understand and operate technology, and communicate effectively. More information about these thinking strategies is addressed in The Exemplary Worker series of books and in the book on Interviewing to Gather Relevant Content for Training. When developing the scope document, it is usually not necessary to state the specific values of the variables, especially if the variables can change when conditions change, such as summer and winter operation. It may be of value though, to indicate that there are conditions which require a change in the variable’s values. I use the above thinking processes as needed. Below, I provide an example of the scoping process to explain where the thinking processes can be used and also to identify some issues that can arise during the scoping process. I point out the value of scoping out each competency for developing relevant training and assessment resources. I also emphasize roles and responsibilities and lines and limits of authority of the target audiences. I reinforce the importance of using the corporate objectives to identify relevant content and to eliminate content that will not contribute to improved corporate, job, and employee performance. For a technical process or system, a sequence of several competencies may be required to specify the required knowledge and job performance. In this case, I point out the need to identify the beginning and end for each competency. If dealing with flows, I also consider the secondary and tertiary flows and in which competencies they should be dealt with. I like to start the scoping of a competency by identifying the purpose and importance of the knowledge and/or task, (i.e., the information that will be used to introduce the training resource). Stating the purpose and importance also helps the workshop participants focus their thinking. For technology, the purpose is the function of the technology. For tasks, the purpose is the results to be achieved by performing the task. · How is it done? The answers to these questions are brief because they are for introducing the training. I may not know the technology or understand the task very well. I point out to the workshop participants that we, the workshop leaders, do not know their jobs and sometimes need an explanation about the technology or task so that we can give continuity to the scoping points and ask relevant training and performance questions. The advantage of only having a general knowledge about the technology is that I can ask related questions and not make assumptions about the technology or lead the participants as to what the content should be. If I have a working knowledge about the competency, with caution, I may suggest the content that a different company considered. I do not mention the company’s name. I ask myself questions about LO-PEMEO and the corporate objectives to identify critical information. I also ask myself What if . . . ? questions about PEMEO to identify what can go wrong. If the questions I ask myself seem relevant, I will ask the participants. To learn about a structured way to ask What if . . . ? questions, refer to The Exemplary Worker—SafeThink book. As I work with participants to identify relevant content, the other workshop leader types the information and pays special attention to getting the hierarchy of the points correct. Mixing a major point with detailed points is confusing for those who validate the scope document. After gathering six to eight points, the other workshop leader reads back the points to confirm the entries and to stimulate thought about important information that has not yet been recorded. When content seems not to be particularly relevant within the roles and responsibilities of the target audience, I refer participants to the corporate objectives to determine if the content has value. I may ask how the specific audience would use the information on the job. When documenting training, I am always surprised by how much employees must know and do. I point out to the workshop participants that it is important to only include content that has a job application and helps decision-making to contribute to corporate, job, and employee performance. The scoping process may reveal that a competency is very large and complex. For practical training, I will ask the workshop participants how they have delivered the training and if the training can be divided into smaller chunks. If the content can be divided in a way that fits the job and is practical for training, these divided competencies must be added to the training profile. When first identifying the competencies, we may have determined that some generic training about the concepts involved in processes and systems was useful and practical. Then, when we scope these site-specific competencies, we may see that the concepts can be easily cut into the explanation on how a piece of equipment or process works. The benefit of including the concepts in the site-specific competencies is that the concepts can have more meaning for the trainee. The generic competency could then be eliminated from the profile. After a competency has been scoped, I and the workshop participants check the corporate objectives for missing information. Given that participants have become familiar with the thinking strategies and basic training and performance concepts, I am usually surprised that, for a few competencies, there are differences between participants about the method(s) that should be used to assess training. I ask the training coordinator to provide me with one copy where the relevant validation comments from each reviewer have been combined. A single copy of relevant comments makes it easier for us to update the documents. Sometimes different validators have different points of view; sometimes validation comments are ambiguous or hard to read. The training coordinator is in the best position to resolve these issues. The approved training profile is not sequenced for training. When possible, soon after the training design has been approved, I like to work with the customer to develop a training sequence (training matrix). Part 3 of this series of blogs addresses some unique situations and solutions for sequencing on-the-job training. Have you used a similar strategy to scope out the content for competencies before gathering the content? Are there any ideas that I have provided of value to you? Do you use strategies that I haven’t mentioned for designing scope documents that work for you?